Our client’s ambition inspires us to innovate, finding ever lighter, stronger, more efficient and more sustainable solutions. Our R&D department relishes every challenge and are always seeking improvements in packaging and disposables to help customers. This results in a more successful, efficient product. Our lab sits at the forefront of IML innovation. It’s a resource that’s built to adapt to clients ambitions and innovate its way to a solution. Our technicians wealth of expertise, ingenuity, industry knowledge and inspiration is at your disposal. To create the most efficient production process possible for our clients, we built our own robot systems for labels and packaging. All the moulds are standardised and modular – and due to the techniques and materials used, the moulds will last more than 10 years. Our R&D department develops everything in 3D, working closely with the customer to go through each minute detail before anything goes into production. We can virtually build all parameters and then turn it into a physical prototype. This lets the customer really feel the product – and discover the most efficient process. There are more than 65 injection moulding machines running in our state-of-the-art production facility, with a clamping force ranging of 800 kN to 6,000 kN. This is perfect for making almost any thin and strong package. And thanks to extra microfilters in the compressed air system, everything is clean and sterile. 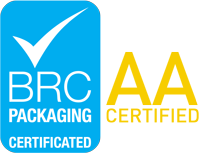 We’re proud to say that Moens Mouldings is BRC global packaging grade AA+ certified. One of only a few in Europe to achieve such an accolade. In our product monitoring system we record every tiny detail for each item: from purchasing to shipping, from raw material to end product. Because we hold stock for our customers, we can guarantee tight delivery times. We work with min / max order strategy to determine the maximum value of the order quantity. Thanks to the FIFO method, we know exactly where each product is stored for each location.